What in the world is a Sone – how loud is my exhaust fan? If you have looked into any type of ventilation products (exhaust fans, range hoods, etc.) then you have probably come across the term Sone(s). The Home Ventilating Institute (HVI) defines a sones this way: “In technical terms, a sone is equal in loudness to a pure 1,000 Hertz per second tone at 40 decibels above the listener's threshold of hearing. In layman's terms, one sone is equivalent to the sound of a quiet refrigerator in a quiet kitchen (source HVI).” – www.hvi.org. The thing to consider with sones is that 2 sones is twice as loud as 1 sone, 4 sones is twice as loud as 2 sones and so forth. In exhaust fans choosing a fan with a sound rating at or below 1 sone will be very quiet. 1 to 2 sones will be heard and anything over 2.5 sones will be noticeable. Generally the sound level of the exhaust fan will be a major contributor of the cost. The quieter the fan the more expensive it will be. The number one reason people do not use their exhaust fan is because of sound. If it is too loud it will not be turned on. If the exhaust fan isn’t being utilized, it can lead to bigger issues like mold, mildew and decreased indoor air quality. Quiet operating fans are available in all price ranges and spending a little more for a fan that will be properly used will be a wise investment. The sound measurement in range hoods is the same as in exhaust fans. The main difference is that range hoods typically have 2 or more speeds. You will see manufacturer’s advertising the “normal operating speed”. This is the speed setting that the hood will generally be used at. For instance, if you are using one pan on a medium setting on your cook top, you probably do not need to have the range hood set to the highest speed setting. The “normal operating speed” will probably be sufficient to properly ventilate the area. With that being said, you should pay close attention to all the sound levels of the range hood. While the high speed might be 5 or 6 sones – which would be considered high, the normal operating speed sound level might be around 1 sone, which would be considered quiet. To learn more about low sone products from Air King visit www.airkinglimited.com. Location, Location, Location – where is the best place to install an exhaust fan? Seems like a fairly easy question that the exhaust fan should go in the bathroom – right? The simple answer is yes, but we want to look into it a little deeper than that. When using an exhaust fan inside a bathroom, the exact location can have a large impact on the effectiveness of the fan. 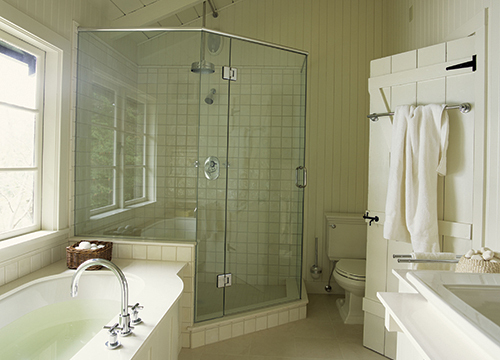 For instance, in a typical bathroom, the shower is going to produce the most amount of moisture that needs to be exhausted out of the home. By placing the fan within the shower stall, you are increasing the effectiveness of the fan as the moisture can come straight up into the fan and out of the home. Conversely, if the fan is on the other side of the room, the moisture from the shower has to travel across the room and out. CAUTION: In order for a fan to be used in the shower stall it needs to be tested and approved for this use. It needs to say something to the effect of “Approved for tub/shower use on a GFCI circuit”. The GFCI (Ground Fault Circuit Interrupter) is a safety feature that will shut the power off if moisture causes a hazard. Fans that include a heater function should never be used inside a shower stall. If your fan can’t be used inside the stall, it is suggested that it be installed right outside of the stall – minimizing the distance the moisture has to travel. In larger bathrooms, two fans might be necessary. One installed in the shower stall and the other installed above the toilet. Once again, the goal is to locate the fans so they are as close to the source of contamination (moisture or odor) as possible. Exhaust fans are no longer just for the bathroom. In future post we will look at whole house ventilation as well as ventilating areas such as garages, laundry and utility rooms.